Our Titan XD PRO-4X test truck featured the Cummins 5-liter turbocharged V8, which produces 555 pound-feet of torque @ 1600 rpm, and 310 horsepower at 3,200 rpm. Power is put down to the TITAN XD PRO-4X’s 4×4 system by way of a heavy-duty six-speed automatic transmission, developed exclusively for the Titan XD. The result is a towing capacity of 12,600 pounds with a gooseneck trailer, which is good enough to tow your favorite boat or other toy of choice. The engine makes driving the large Titan XD PRO-4X a fairly pleasurable experience. It’s not built for speed, but it does get up to highway speeds effortlessly, even when laden with a full load in the bed or a trailer. The Cummins V8 diesel isn’t quite as refined as the diesel engines in some of the competitors vehicles in terms of NVH, but the sound certainly makes you feel like you are driving a semitruck rather than a pickup truck.  This isn’t necessarily a bad thing, but sometimes the roughness at city speeds is quite noticeable. Because the Nissan Titan XD is rated as a heavy-duty truck, there is no EPA estimate available for fuel economy. Staying in 4×2 though, we averaged about 15.2 mpg in mixed driving on city roads, and 75+ mpg highways. Not too bad, given the heft of the Titan XD. Handling wise, there is no doubt that you are driving a heavy-duty pickup while behind the wheel of the Titan XD. For comparison, the Titan XD PRO-4X weighs in at a hefty 7,158lbs while the heaviest 2019 Ford F150 4×4 SuperCrew weighs in at 5,320lbs. That said, the Titan XD Pro-4X drives much easier around town and in parking lots than any other heavy-duty pickup truck I’ve driven, including RAM 2500s and SuperDuty F-250s. Again, the Titan XD is not meant to compete with the 2500 series trucks, but offer an in-between product offering that gives the owner more utility than a 1500, while being easier to live with on a daily basis and more economical than a 2500. Titan XD PRO-4X models are off-road oriented and come trail ready with 275/65/R18 all-terrain offroad tires, 18″ six-lug alloy wheels with a model specific painted dark finish, Bilstein off-road shock absorbers, an electronic locking rear differential, a powder coated lower radiator skid plate, and Hill Descent Control. In the bed, the 2019 Titan XD comes with a new integrated gooseneck hitch with plug-in the 6.5 foot bed. 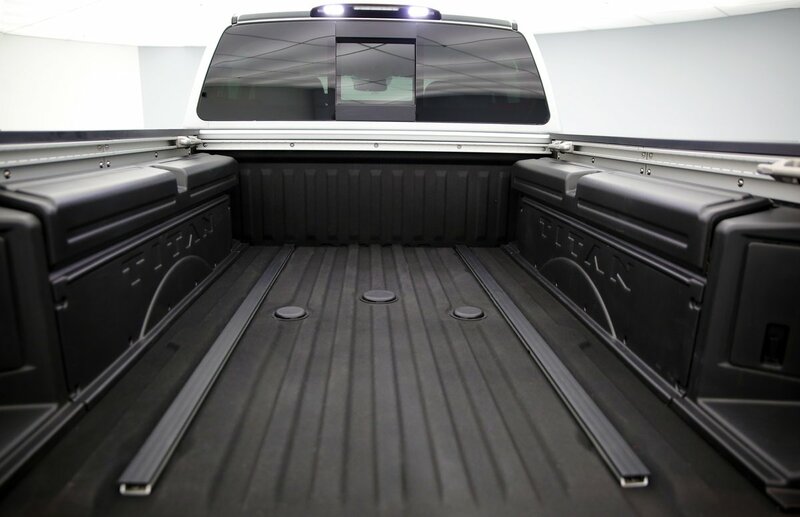 Titan XD also features the Utili-track Bed Channel system which features four aluminum alloy cleats for greater flexibility when using the tie-downs. Our Titan XD PRO-4X tester came equipped with the dual lockable watertight and drainable in-bed Titan Box storage boxes, which are invisible at street level. A retractable step gives quick and easy access into the bed. On the inside of the Titan XD PRO-4X, there is a 7.0-inch color touch-screen display which has new for 2019 Apple CarPlay and Android Auto capabilities. Also included on the Titan XD PRO-4X are the array of safety features like Blind Spot Warning, Rear Cross Traffic Alert, Rear Door Alert (reminds drivers to check the back seat after parking) and RearView Monitor with Trailer Guides. 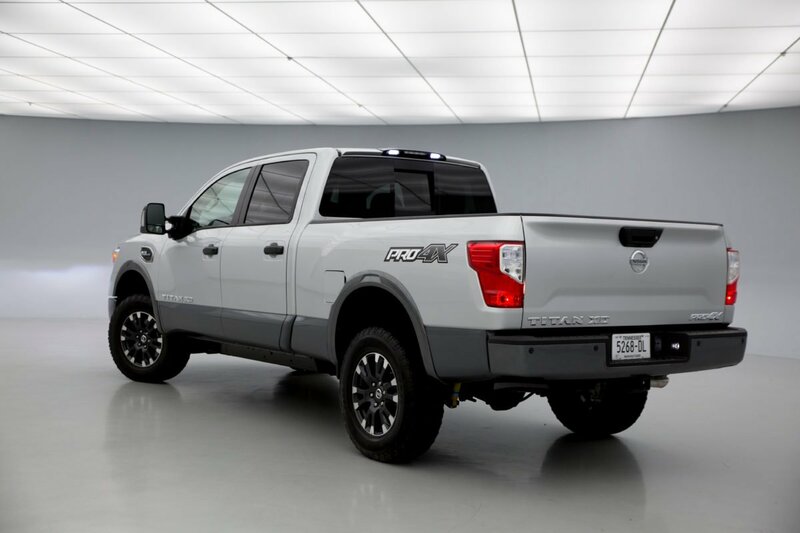 All of these features work exceptionally well on the Titan XD, just as they do across the entire Nissan lineup. Nissan’s safety technology features are some of the best in the business. The Titan XD PRO-4X features Captain’s seats with the driver’s seat featuring 8-way power adjustments with power lumbar support. Detailed touches include model specific PRO-4X seat embroidery, a leather-wrapped steering wheel with contrast stitching, metallic instrument panel finishes, and contrast stitching throughout the rest of the cabin. Floor mats also get the model specific PRO-4X branding. The back of the center console features a 110V power outlet, with a 12V power outlet in the console box. There are also two USB-A charge ports on PRO-4X models. Our tester also came equipped with the $3,545 PRO-4X Convenience Package, which adds a 4-way power passenger seat, heated front and rear seats, a power tilt and telescoping heated steering wheel, seat memory functions, remote start, and auto-dimming mirrors. The $1,545 Premium Package includes the awesome Nissan Around View Monitor, and ventilated front seats. 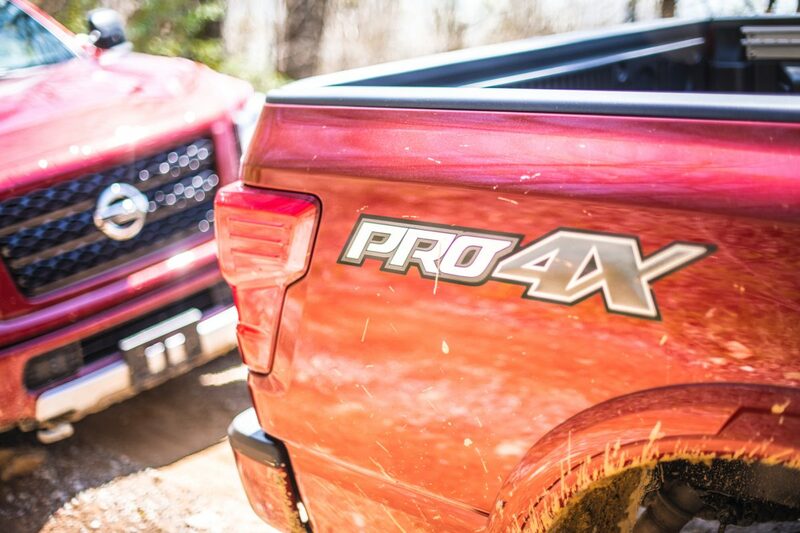 To be clear, the Titan XD Pro-4X is a heavy-duty pickup, and drives like one. It’s targeted at a very specific niche who need something in between a half-ton truck and a three-quarter ton truck. It’s not quite as easy to drive as a 1500, but it’s cheaper and more livable daily than a 2500 series pickup. It does what it does well, even if it’s appeal is to a niche audience. If we needed to tow a boat or car around on a regular basis, we would definitely consider the Titan XD with the Cummins. 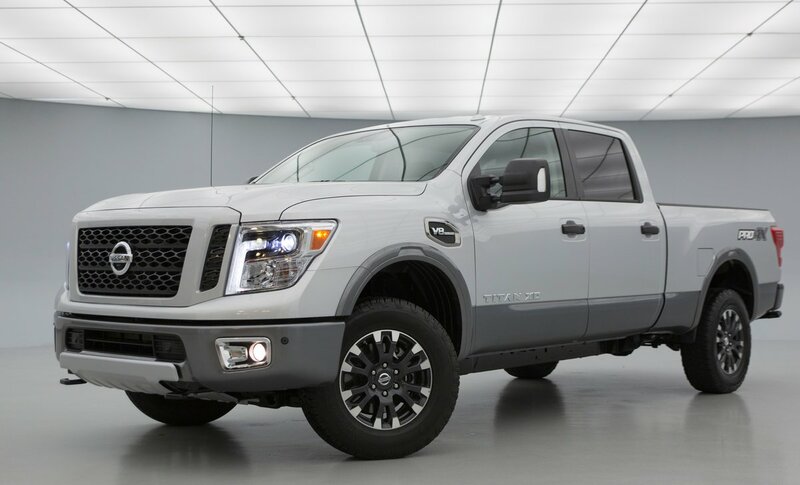 If we were just looking for a great truck with a little less niche appeal, we would push buyers to strongly consider the Titan XD or Titan with the 5.6-liter Endurance V8. That being said, the 2019 Titan XD Pro-4X a great truck any way you rev it.